Coverage: Live on BBC Radio Wales, Radio Cymru and BBC Radio 5 live, plus live text commentary on the BBC Sport website. 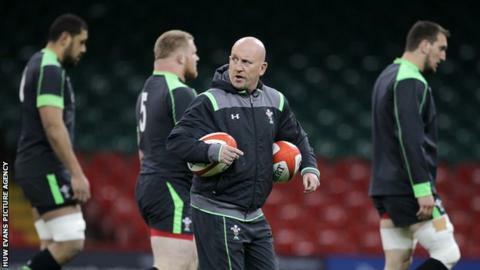 Wales defence coach Shaun Edwards has avoided questions about his future by saying he has his hands full trying to combat Australia's backs on Saturday. The 48-year-old's contract finishes at the end of the World Cup, and he has been among those mentioned as a possible future England coach. "I think I'll just concentrate on Australia at the moment," he said. "I watched them play the other day on a couple of tapes, and I've got my hands full thinking about that." Edwards has worked as Wales' defence coach since 2008, firstly on a part-time basis while head coach at Wasps before taking up the position full-time in 2011. He has helped Wales to three Six Nations titles in 2008, 2012 and 2013 - including two Grand Slams - and a World Cup semi-final four years ago. He was offered the role of coach to England Saxons, but turned down the role in favour of his post with Wales. His name is again being linked with England following their exit from the World Cup after defeats by Wales and Australia. But the former Great Britain rugby league international insists all his concentration is the Pool A decider and taking Wales further in the competition. "We're playing against the current champions of the southern hemisphere and a team that's been in fantastic form recently," Edwards said. "Any team that can beat the All Blacks, which they did in the summer to win the Rugby Championship, you're talking about an incredibly formidable force and we have to be at our absolute best if we've got any chance of beating them." The winners of Saturday's match will face either Scotland or Japan in the quarter-final, with the losers having to take on twice-winners South Africa. But Edwards says topping the pool is not Wales' main target. "Well, it would be a very good achievement but we're a little more ambitious than that," he added. "Top of the group will be great, but it's only a pathway to something better than that."